Lesson: This lesson teaches you how to size and re-size aboard using the four tools within SketchList 3D. You will also learn the relationship between size and location. Summary: The size of a board [or any object really] in a given direction is the distance between the outside edges. Right edge – left edge = width. Top – bottom = height. Back – front = depth. 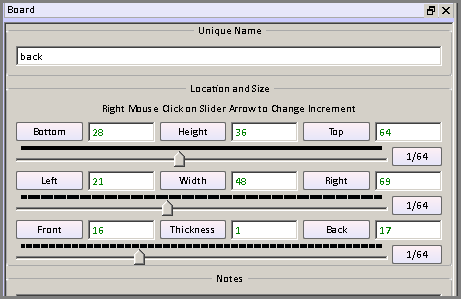 The task of setting or changing sizes is that of entering one or two of three numbers – left edge, width, right edge — and having SketchList 3D calculate the necessary result. Right = 48 left = 18 then width must = 30. How to size and resize a board. 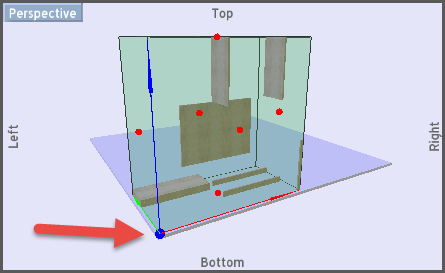 Learning Objective: Learn to use the tools of SketchList 3D to set and change the height, width and depth of boards. Learning Resources Definition: Size – set or change any or all of the dimensions of a board. SketchList 3D open project and insert assembly. Activities Make 3 boxes using SketchList 3D. The objective of this lesson is to show you how to use the tools and SketchList to size and re-size boards using the four tolls within SketchList 3D. You will also learn the relationship between size and location. One of the advantages of designing your woodworking project on a computer as opposed to drawing it on paper is that the computer makes it much easier to correct mistakes, try alternative designs, and make adjustments as necessary. A big part of this flexibility involves sizing and resizing boards (really resizing any object in the design). SketchList provides a series of tools and methods to make it very easy to size a board as your design requires. There are four tools within SketchList 3D that will resize boards in your design. Red Dots: Click the red dot icon near the top of the screen. Then select the board you want to resize. Grab one of the red dots with your cursor/mouse and while holding down the left mouse button drag the red dot until the board is the size you wish. As an alternative you can right-click the red dot and fill in the form that opens. You can enter either the new size or the edge value. Triplets: Triplets consist of the nine buttons/text boxes on the board form. Within each role of the triplet – for example bottom, thickness, top – there is a relationship that determines the size and location of the board. In our example top minus bottom equals thickness. To use this as a tool you can enter any of the three values and click on the button of that value you want to change. The simplest case would be to change the thickness by typing a new value in for thickness and clicking the button labeled top. Another way to achieve a change in the thickness value would be to type in a new number for either bottom or top and click the button labeled thickness. In fact you can change the values of for both bottom and top and click thickness. Experiment with this and watch the affect your changes have on the board in the image viewing area. Sliders: Sliders can be used to change the values in the text box in the triplet. Highlight the text box you want to change, for example thickness, and slide the little button to the right and left and watch the value of thickness change. Then click the top button to make that change takes effect permanently. Spreadsheet: the spreadsheet can be thought of as a horizontal presentation of the buttons of the board form. The column headings for the spreadsheet in fact act like buttons. In the spreadsheet changing the value of that thickness for a board and clicking the column heading top will change the thickness of the board by moving the top edge upward. These are the four ways by which you can change the size of a board in SketchList 3D.